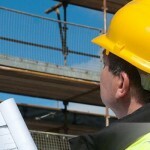 The CSCS Card system is designed with a good career progression in mind. No matter what level you start at, the path to the next tier in construction professionalism is laid out before you, so you know exactly where you should be in terms of qualification and acquisition of experience. Getting your CSCS card is a simple process, even when starting from the absolute beginning. Let’s have a walk through a typical CSCS career progression, beginning as a trainee and progressing upwards; starting out with a Red Apprentice CSCS card. You need to be enrolled on a recognised apprenticeship scheme and applying for your NVQ Level 2. Once you’ve gained experience, attained the NVQ and taken the Health & Safety Environment Test, you can then apply for your Blue CSCS card. Meaning you are no longer an apprentice, you’re a fully-fledged tradesman. When you’re confident that you’ve got the skills and the experience required you’re able to go for your NVQ level 3. This means you can apply for a Gold Card, making you qualified for a role as a supervisor. Once you have it, you’ll be able to apply for any supervisor’s position and instantly be able to prove that you’re made of the right stuff, simply by flashing your shiny new card. Finally, after a few more years experience and many, many anecdotes in your back catalogue, you’re ready for the last stage; an NVQ Level 4 and a Black Managers Card. You’ll be required to take a manager level CSCS Test but once completed you’ll be able to swagger on to a new project, confident in the knowledge that you’ve well and truly earned your stripes. You’ll be able to manage your team effectively and ensure that safety and productivity are paramount. The path to that coveted Black CSCS Card is by no means easy, but it’s structured and clearly bench marked by progressive card levels. You’ll really feel like you’re achieving something and not in any danger of becoming stuck in a rut with no job satisfaction. Worth considering, right?